Alliance General was established July 1, 2004 in the state of California, by Mark Rogness, with the prime goal of providing the construction industry with a contractor that would offer a sound and moral philosophy with quality results at a fair cost. 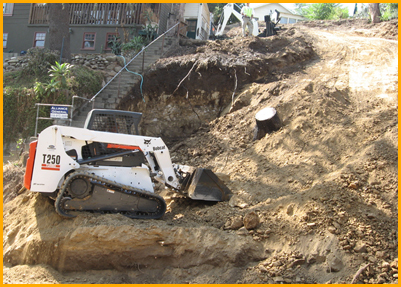 We are achieving that goal, and by doing so have become one of the region’s reputable excavating contractors. My experience began in Idaho in the mid 1970s as a laborer for a highway construction company. After two years I started my own company, building basements. I branched into all types of concrete work. In the mid 1980s I moved to Arizona, where I broadened my territory. My company grew to thirty-five employees while I also managed a plumbing company. As a subcontractor I offered plumbing and concrete as a package to general contractors. From the ground up I know what it takes to build a quality project. Call Alliance General today at 310-913-3089 to get started! Copyright 2010 Alliance General: Excavating Contractors. All Rights Reserved. Alliance General works very hard at supplying a quality product. I have found that using superior materials the right way proves lasting results. No one wants the integrity of their project compromised by inferior products. Alliance General’s reputation is built on products and performance.